Inspired by the recent nominations of Spotless and Adelaide Oval (thanks for the plug Mickey), it got me thinking. Perhaps there’s a way to celebrate the many theatres of football on this year’s cover? I present the light towers of 2016! Footy light towers. Biro on scrap paper. 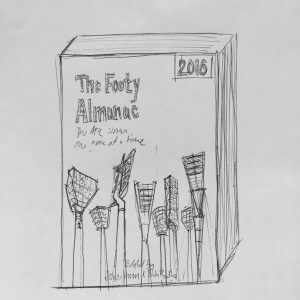 The cover would appeal to all footy fans (every outdoor venue is there) and may even attract a lucrative sponsorship from an electricity company and/or light bulb manufacturer. Bright idea or power outage? (note: the final version will look less like a collection kitchen utensils).